SEO has changed considerably over the years. In part, this is down to Google-once a structural or algorithmic change occurs, SEOs the world over quickly get wise to the game, only for Google to reposition the goal posts at the drop of a hat. A prime example of this would be when Google eliminated PPC ads from the right-hand side of the screen – for the first time in the search engine’s history, it meant that organic listings would no longer appear above the fold on page one. Game changer. Essentially, more clicks would ultimately be won by the PPC ads that appear first, thus diminishing the value of the top-of-the-page organic results. It was also a stark reminder of Google’s emphasis on paid search over organic-they’re a business, at the end of the day and are out to make a profit. Changing consumer habits and how we, as individuals, consume data has had the biggest effect, however. The proliferation of mobile devices, tablets and super slim laptops, coupled with a faster pace of life and an almost omni-present source of Wi-Fi, has meant that we all shop, work and maintain a personal life on the go. Gone are the days of waiting to get home to look something up on Google-we now do this wherever we are, whenever we want, in the blink of an eye. The ubiquity of mobile devices and the dramatic increase of searches performed on the go has meant that SEO practices have inevitably adapted and changed too. One of these adaptations comes in the form of local SEO. What is local SEO and how is it different to regular SEO? Local SEO refers to the practice of optimising a business’ website specifically for local search results. 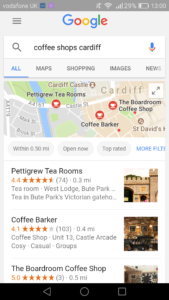 For example, if someone in Cardiff city centre utilises the search term ‘coffee shops Cardiff’, Google presents the most relevant search results in conjunction with the maps feature-the three most relevant search results will appear above the fold as per the screen shot above (other locations can be found by clicking on the ‘more places’ tab below). It favours those businesses with a bricks and mortar store and a local geographical location. In contrast, businesses that exist exclusively online or serve the whole of the UK (think Amazon, online tour operators etc.) will appear below the local listings in the traditional organic listings where appropriate. This information is intended to make it easier for the searcher to evaluate the business presented and find it. The Google maps box with three local search results contained within is referred to as the 3-pack, and its importance for local search/businesses cannot be overstated. Before, this box was once known as the 7-pack and favoured desktop search results. As most searches now originate from a mobile device, the 7-pack was eliminated in favour of the 3-pack. Not only does the three-pack fit perfectly within the dimensions of a mobile phone screen it also appears completely above the fold, as the image here demonstrates. Whilst this makes competition for the top three results much more difficult, it also makes them a lot more lucrative: as with purely organic results, the 3-pack receives the lion’s share of search traffic. This diminishes somewhat if PPC ads appear first, yet the traffic received in this instance is still worth fighting for as many people treat PPC ads with hostility and scroll straight past them. – Your law firm needs the help of marketing agency that can hold weekly meeting to discuss content marketing strategies. A local firm would therefore fit the bill. – You’re running late for a Job interview and can’t find the building? Google to the rescue! Once you have completed your business profile, you will be prompted to request an activation code. Google will need to verify that you have a bricks-and-mortar business and will therefore email you a postcard with your activation code within 5-7 working days. Once received, log back in to Google My Business and submit your activation code. Done. You are now registered on Google My Business. Similar to links, citations are local mentions or listings of your business. The more local citations you have, the better-just like backlinks, there is a positive correlation between the number of citations a business has and its position in the local search results. Make sure your business’ NAP (name, address & phone number) is consistent and correlates with what is featured on your website. Any variations will work against you as they will not be considered accurate nor relevant. Customer reviews and testimonials are another factor Google takes in to account when determining local search ranking. 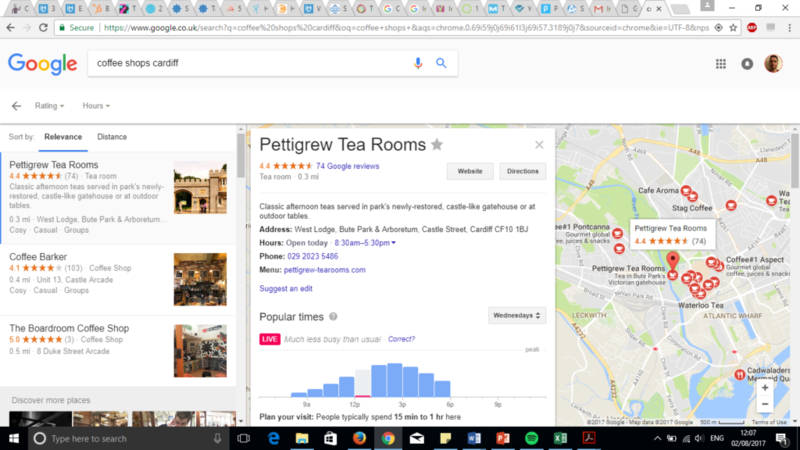 These reviews are submitted directly by your clients (a bit like TripAdvisor) and are public-they appear next to your listing in Google maps. The best way to solicit reviews is by reaching out to your previous clients and asking for them directly. It would be easier in the long-run if customers left reviews without being prompted, so consider adding some information detailing the value you place on Google reviews on your website and initial proposal literature. Instil confidence in present customers and future prospects by replying to each review. As with organic SEO, Google favours those businesses that offer the best possible user experience. This can be replicated on local search results through not only the inclusion of accurate and up to date information, but also relevant photos. Well curated photos will help tell the story of your business, plus it is also a good way of showcasing a summary of what you provide-useful for those on the go. Above all, you need to ensure your website is mobile friendly, too. You will be penalised heavily by Google if not. Relevance-how relevant is your business to a searchers query? A good way of improving search relevance is by adding as much information about your business to your Google My Business profile as possible-businesses with complete information will outrank those with vague or missing information. Distance-how far away is your business from the searcher? 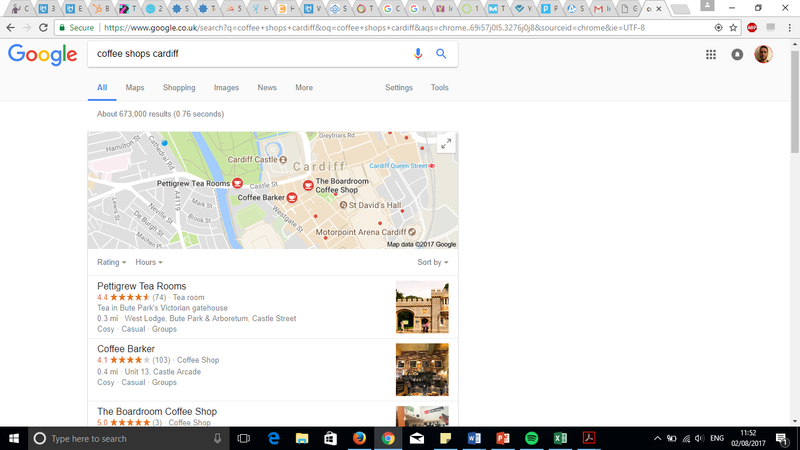 If, for example, you use the search term ‘coffee shops nearby’, the coffee shop 100 metres away will out rank the one that is half way across town. Prominence-how well known is your business? And how much information can Google gather about your business from the web? Citations, reviews and standard off-page SEO practices will contribute to this. Local SEO can be tough to get to grips with, especially if you have little overall SEO knowledge to begin with. For a no strings attached consultation to see how we can get your business ranking high within the local search results, head over to the contact page and get in touch!